A Tribute to Two Icons I Admire! The year end and the year beginning eerily reminded me of two popular female icons whom I admire till date for different reasons; but, the common factor being that both were film stars. First it is Jayalalithaa (24 Feb 1948 to 4 Dec 2016) who came into filmdom, rather with a bang in 1964 with Sridhar’s ‘Vennira Aadai’ and immediately started climbing to stardom with her pairing with the legend MGR in ‘Ayiraththil Oruvan’. Those days, watching a movie is an event for me and though I did not watch the MGR movie in the theatre, I watched ‘Vennira Aadai’ in the cool ambiance of Anand Theatre. Another wonderful theatre where one can find beautiful carvings of lovers inside the auditorium and wonderful paintings of artist R Madhavan in the foyer. Indeed, these are important points (remember my earlier post on Safire complex!) for me and for others it may be beside the main topic. Jayalalithaa’s film entry and ascend was, in fact, an easy one; because of her exceptional looks and youth. She completed 100 films in 1974, (Thirumangalyam, a flop) just within a decade. But, except for a few movies many of her films were just entertainers only. Her wisdom came to light only after her film career when she started writing and evinced her interest to enter politics through MGR and became a Rajya Sabha member. Later, her determined efforts to lead the AIADMK after MGR’s demise were something historical and awesome. Her dramatic successes in elections cannot be just dismissed as luck or her populist schemes. Unfortunately, the enormous power she wielded over the public and polity, her hubris, unquestionable faith in some clique followed by her failing health brought her waterloo. Yet, she will remain in the memory of Tamizh population, may be of my generation. Sridevi (13 August 1963 to 24 Feb 2018) on the other hand was a humble girl but an excellent actor who not only had the credit of shining in all the southern language films and also in Hindi film field for a long time. Even her two last movies ‘English Vinglish’ and ‘Mom’ are testimonies to her exceptional acting prowess. It is sad that her death is, in a way, shrouded with mystery and many speculations were afloat like her obsession to keep her figure and beauty in tact fighting against the odds of ageing. But, I understand one thing from the lives of these two exceptional women that notwithstanding their command over the mediums they have chosen had fallen prey to some whims and their ends were, in a way, triggered it. We will come across very rarely like an actress turned successful politician like Jayalalithaa or an actor who conquered the entire Indian film industry as Sridevi. I also don’t want to see such successful lives getting snapped at the most unlikely moments again. I too agree with your views; yet, none can say that they didn't have talents. 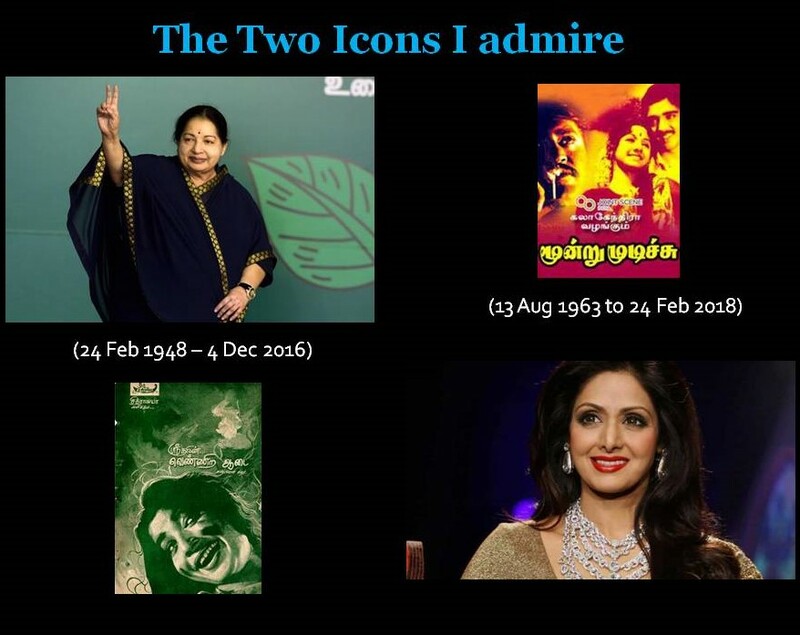 In my opinion, Jayalalithaa is no comparison to Sridevi in acting and I have not much regard for her as an actress. But, her political career against the most cunning and scheming Mu.Ka and defeating him several times is definitely an achievement. Yes. Both mothers were actresses. But, of no name or fame. I am happy that your read my posts and share your opinions.Thanks Mr. Rao for the comments. I agree with previous accounts that Sridevi is a rare meteor in terms of talent and career success. Very few have that kind of career success in their chosen field. I admire her more for her success for the sake of success. Her death in unnatural circumstances is regrettable. "I also don’t want to see such successful lives getting snapped at the most unlikely moments again." This statement is perhaps true for Sridevi, but not the other. Jayalalitha did not die young by any standard and lived a full life; had prolonged illness and got latest medical care. One thing to remember here is both have their mothers in the field as actresses. This is important to get initial break in the movies.